You guys, December is whizzing by! Since January, I’ve made a point of reflecting on my business month to note achievements and productivity. I can’t wait to look back on it at the end of the year. One of the things I am so grateful for (as well as support from you!) is press features. It is still pretty surreal for me to see my face or projects in print and the excitement never wears off. First up is Simply Crochet issue 39. I am so pleased to have a double page article all about Claireabellemakes. I talk about my business organisation, current favourite crafts and when G helps with my projects. 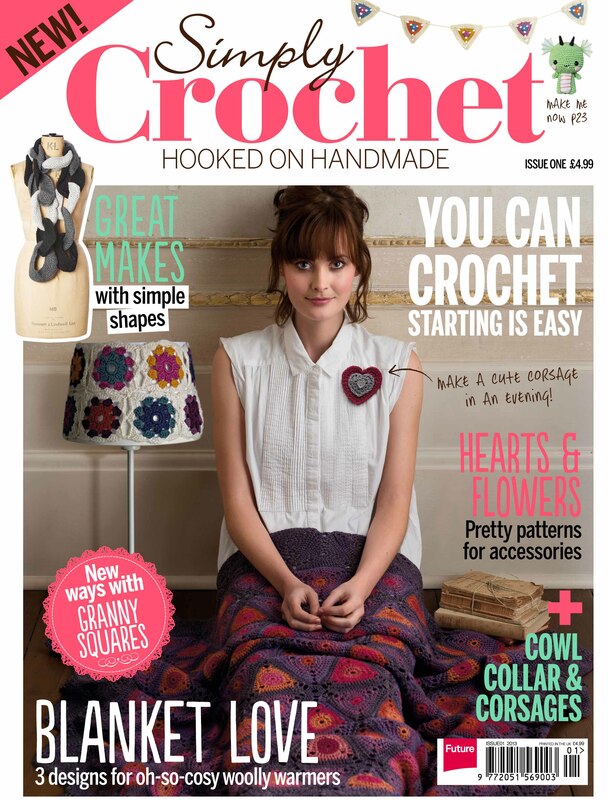 Simply Crochet are currently offering 3 issues for £5 which is an absolute bargain. The magazine has been a favourite of mine for a while now and I remember getting issue 1 when it launched! Back in September I was approached by Creativity Magazine (by Do Crafts) and I’m so pleased they included me in their Blog of the month feature. Keep an eye out for issue 66 of Creativity Magazine where I have some scrapbooking projects to share. I hope to work with them more in the future and to grow my craft writing profile in 2016, so watch this space! Today’s post is a little catch up of all the exciting things that are happening for Claireabellemakes at the moment. I hope you wont mind if I share! This month I have an interview in Simply Crochet Magazine (issue 28) alongside some lovely people I admire greatly. Myself, Not So Granny, Patchwork Heart and a few more are talking about tackling your WIPs (works in progress). My Crochet Totoro has an appearance and there is a photo of me in the studio alongside my finished Granny Square blanket. If you fancy picking up a copy of the magazine, you can find it in WH Smiths and supermarkets, or click on the banner below to subscribe. You can also find it as a digital version via the Apple store or Google Newsstand. This week I’ve also been interviewed on the Blogtacular Blog! I’m sharing my story and what blogging means to me. For those of you that don’t know, Blogtacular is a big UK blogging conference which takes place yearly. I’ll be heading there in June to learn even more about blogging and to meet some friends for a day out in London. Please let me know if you’re going too. Lastly, whilst I’m on the subject of blogging events. I am also helping to organise a Cambridge bloggers meet up! CambMeetUp takes place on 7 March 2015 and tickets can be booked here (it was close to being sold out yesterday!). Give me a shout if you are planning to come along! Thanks for letting me share my updates today. As a fairly new crocheter, I am very excited about yet another craft magazine (a little addiction) and have documented my journey with the hooky hobby here and here. I can’t wait to get stuck into the magazine and feel inspired about some projects for the new year. Mind you, I must finish my granny blanket soon! and $10 if you live in the US/Canada (http://www.imsnews.com/simplycrochet-2001). *This is not a sponsored post, but rather an EXCLUSIVE of the front cover which Simply Crochet have asked me to share with my readers.